OKLAHOMA CITY — Oklahoma City Thunder guard Russell Westbrook will miss Wednesday's game against the Cleveland Cavaliers because of a sprained left ankle. A Thunder spokesman said Tuesday the team wants to see how the ankle responds to treatment for the next few days before providing another update. 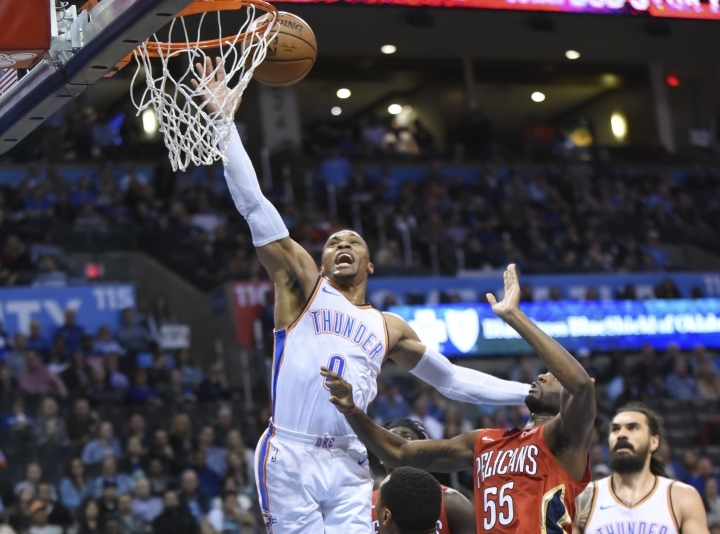 The Thunder won their fifth straight game by beating the New Orleans Pelicans 122-116 on Monday but lost Westbrook in the third quarter. After coming down hard on the side of his foot, he pounded the ground in frustration before limping off the court. Westbrook finished with 17 points, nine assists and seven rebounds. Westbrook had a procedure on his right knee that cost him the preseason and the first two games of the regular season. The Thunder are 5-2 with him in the lineup and 0-2 without him. The former league MVP is averaging 24.1 points, 8.9 assists and 8.3 rebounds per game.